You refer and link to DiSC but your image is from a different DISC profile. The morning for Everything DiSC and DiSC Classic created an even distribution of people across styles. It is confusing because DISC is a model and many instruments built upon it use the word in their name. I agree with you that DISC is probably better than MBTI – especially when done remotely. 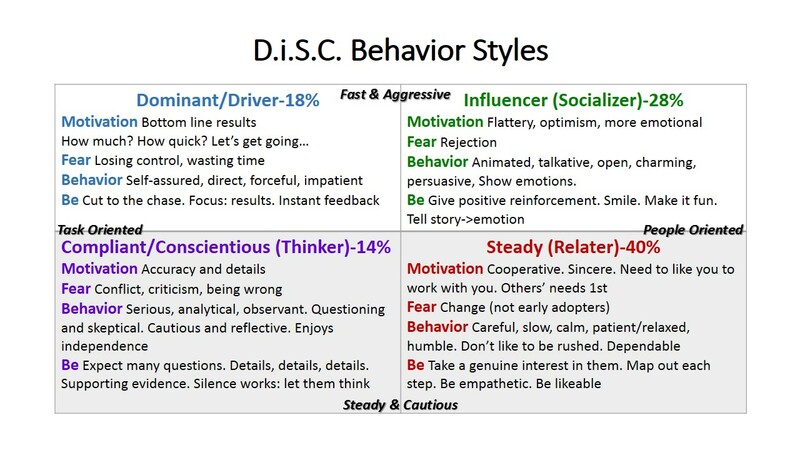 DISC is essentially very similar to the Merril-Reid Social Style matrix that I’ve been using since the mid-1990s. This was devised in 1981 – and is almost the same as DISC. (I think the only differences are a few of the names – e.g. Thinker is “Analyst” in the Merrill-Reid model. This was extended anyway by a husband and wife team (See: Bolton & Bolton, 1984). I now use NLP principles – of which these are all essentially a subset. NLP also teaches a more holistic approach overall that helps explain the exceptions. (The way I was taught it – relating to DISC is to imagine the typical “Driver” who in the office is assertive – even aggressive. He (normally a He in this context) comes home and all he wants is to put his feet up, have a whisky and relax. He has stopped being a Driver and may have moved into another box. DISC, etc. can explain this when you look at the impact of stress on individuals – where they move from one box to another. The fact is that work, many people are more stressed than at home and so move into a different box. This means that when you put them in a box, you do so because of how they are reacting to you. An NLP presupposition is that you need to build rapport with people you are working with – and that you can then influence them. It is how politicians work – and you can influence people using specific language patterns – which then helps you get what you want from them.